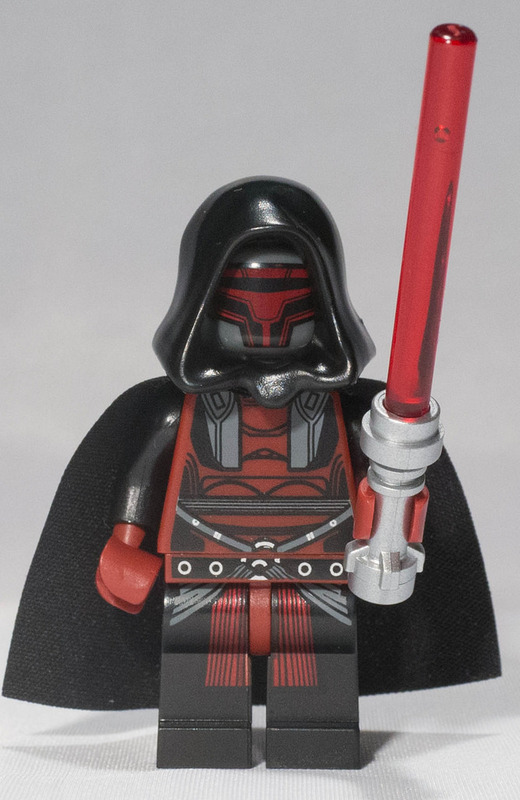 Even though it's just a minifigure Darth Revan is very imposing in his black and crimson robes and armour. Even for a licensed figure he is very well detailed with his armour and mask being accurate to his appearance in the Star Wars universe. 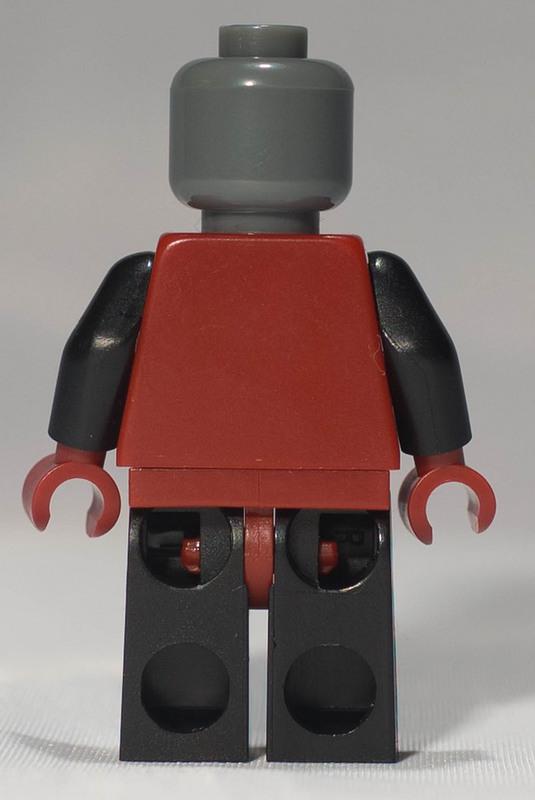 Since 5002123: Darth Revan is an exclusive polybag that only contains a minifigure this set has all unique parts except for the black standard cape and hood. Since the character is from the Star Wars EU (Expanded Universe) for the time being it's unlikely that this figure and the polybag itself will be released in any further sets or promotions. As can be seen above the Revan minifigure is very intricately and throughly detailed so as to be accurate to the source material. His cape and hood are plain black but his dark-red and black T-shaped mask is printed with lines to give the appearance of ridges on a dark grey head. His arms are black with dark red hands while his front torso, like his mask, is printed mostly dark-red with some lines to depict his engraved armour chest-plate with some dark grey and black print on near the top of either side to show where his cloak attaches. Near the bottom of his torso are some dark grey lines, with minute little silver decorative markings, and a silver half-circle for his belt and clasps. 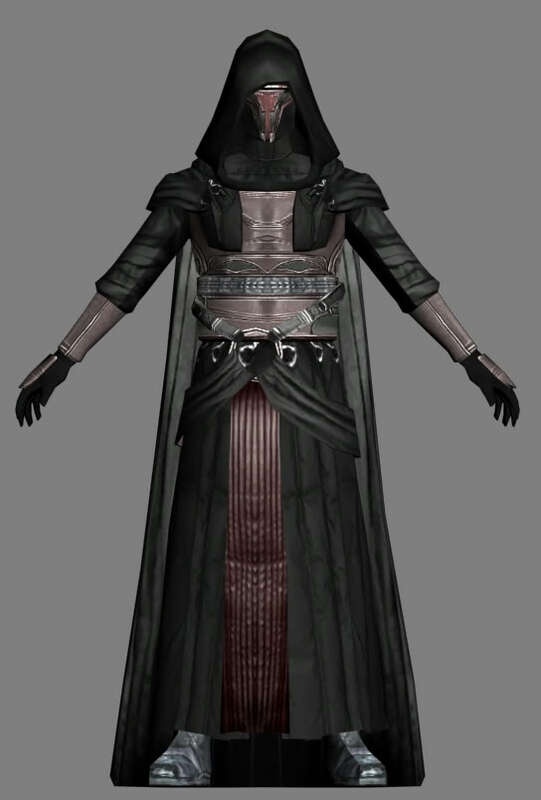 Near the top of Revan's black legs are printed a some grey fringes (a continuation of the decorative robes from his torso). Some dark red with thin black lines are printed down the center of the legs to represent his tunic. Revan's back torso has no printing whatsoever which is disappointing but understandable since his back is never really shown in any media. Since this set is a poly-bag it's obviously quite small and relies more on adding this set to another, unfortunately 5002123: Darth Revan is very much a standalone set/figure since the character appears in the timeline thousands of years before the Star Wars movies take place and even in the Old Republic sub-theme he is not alive around the time of any other characters in the sub-theme. The build of course is simply one standard figure with a cape and hood. Star Wars has always been a powerhouse of a theme, even with the gradual decline in popularity (save for UCS models and some of the other large sets) among AFOLs one can be fairly safe when investing in most Star Wars sets based on any of live action films including, though to a lesser extent, the prequels. However the Old Republic sets are a bit of a wild-card. This set was exclusive to the 2014 "May the Fourth" promotion where it was given out with purchases of more than CA $75. It is highly unlikely that lego will release this in another set since the characters (or variant in the case of 5001621: Han Solo) that are released in May the Fourth sets are specifically chosen to be rare, therefore Revan will almost definitely remain exclusive to this set. Like most other promotional poly-bags this set has good potential, add to that the fact that the figure included is exclusive and you're looking at a pretty high return for a single figure. After having been released just over a month ago 5002123: Darth Revan is performing quite well and the average Bricklink sold price sits just over twenty-three dollars CA. While it hasn't performed as well as 4649858: Shadow ARF Trooper or 5000063: TC-14, this set still sits above 5001621: Han Solo (Hoth). Now by taking a look at the sold Bricklink prices of the other three other poly-bags released in previous years as part of the "May the Fourth" promotion we can get a good understanding of the possible future value of 5002123: Darth Revan. As can be seen in the graph above the two most popular (both in terms of rating and Bricklink price) poly-bags are 4649858: Shadow ARF Trooper and 5000063: TC-14 with the least popular being 5001621: Han Solo (Hoth) and while looking at this information it may appear that the popularity of the "May the Fourth" figures is decreasing with each year, upon closer inspection it becomes apparent why each figure has performed as it it did. The reason 4649858: Shadow ARF Trooper has sold so well is probably due to the fact that the clones are quite popular among Star Wars fans and are often regarded as one of the few truly interesting things to come out of the prequel trilogy. 4649858: Shadow ARF Trooper also had the added bonus of being the first "May the Fourth" exclusive and thus less people knew about the promotion and weren't as prepared to take advantage of it (whereas these days the "May the Fourth" promo is a big event). 5000063: TC-14 probably would not have appreciated nearly as much as it did if not for the fact that it was a nice shiny chrome painted figure. 5001621: Han Solo (Hoth) performed so poorly because it was just a variant of an existing minifigure (and a common one at that) and not a completely new minifigure. Darth Revan on the other hand is one of the most popular characters from the Expanded Universe of Star Wars however his obscurity of character may hurt any future growth. Since 5002123: Darth Revan never really had a production run, was only available for a short period of time and has effectively already been retired most of the potential growth happened in a very short period of time therefore it's unlikely that the average selling price for the set will experience any major fluctuations, and will probably only go up or down a few dollars from the current average sold price (new) of around CA $23. Darth Revan is quite menacing and displays well even though he is just a single minifigure. The Darth Revan minifigure is well done and would make a solid addition to your collection and/or portfolio. If you got this for free as part of the promotion and like the figure I would keep it since it seems unlikely that it will almost certainly not be released in another set. If you don't really care for the figureI would wait at least a year before selling so that it can gain some additional appreciation. If you're looking to buy this figure for your personal collection or to resell now is the time to do it since it's still gaining appreciation on the market and you may be able to get it for a low fee.